Treasured holiday themed heirlooms help us celebrate the season and are precious pieces that tell the story of our families. Before or after the holidays is a good time to take a look at how your treasures are displayed or stored. How are they faring from the last time you took them out? Do they need to be reorganized, sorted, documented, dusted, or better stored? The holiday season is also a good time to talk with other family members and compare notes. It is a chance to ask details like: Where did this originally come from? Or was it made by a family member? Then you can quickly create a written record. It doesn�t have to be detailed; just grab a piece of paper and jot down notes, phrases, and memories. Those written notes are immensely helpful for our own memories and especially for future generations. Before putting away the ornaments, glassware, Nativity scene, and ceramics, take a moment to assess if the items are receiving the best storage care for another year. 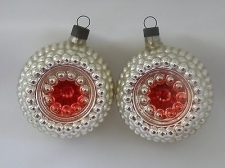 For antique Christmas ornaments, a lightly damped abrasion-free cloth will help remove dust, do not over rub, you might loosen paint or damage the surface. Be mindful of ribbon, glitter, or other decorative pieces. Check for flaking of paint, loose hanging wires or top attachments. 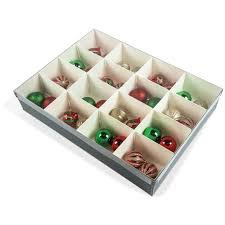 For those precious, delicate ornaments, I recommend purchasing soft cotton batting (from the sewing section) or acid-free tissue and an acid-free box with individual compartments for each ornament (see image). The museum-quality, acid-free material will help stabilize the item, while newsprint, Christmas tissue, and Kleenex contain chemicals and dyes that can be harmful. Antique glassware is popular during the holidays. Keep in mind that china and crystal, although once designed to be used as serving pieces for food, should not be used as such when they are antiques. Age has caused the structure of the piece to weaken and extreme heat and cold can cause cracking or breakage. Passing and over handling of the glassware can also lead to accidents, but if you�re just putting out some Christmas cookies, the piece is likely safe. If you used your antique glassware and ceramic dishes this season, do not put them through the dishwasher, instead hand wash them in warm water with mild dish soap. I recommend lining the sink with a towel to protect the piece from accidental bumping or slipping during washing. If you used your antique glassware as decoration, dusting is most appropriate. Stay away from commercial cleaners, since these often can cause discoloration, or a greasy buildup, and often make handling more difficult. Minimize handling of the objects and always use both clean hands. 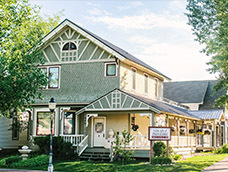 The storage location of your holiday antiques can put a great deal of stress on them. Storage in unfinished basements, attics, or crawl spaces is not recommended because these spaces often have constant extreme temperature and humidity changes. The unstable environment will cause the materials to expand and contract, leading to weakening and damage. I often tell people, if a space is uncomfortable for you to live in, it is not a good space for your antiques either. So remember, as your holidays come to a close, pay attention to the condition of your family heirlooms. 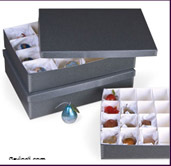 Take a moment to write down why a piece is important to you, and what changes you have noticed to surfaces or attachments, and consider purchasing a new, stable, safe box for your items and surround them with proper acid-free materials. Your heirlooms will thank you. Happy Holidays!